Recently, there has been an increased focus on businesses attempting to become data-driven. Companies are investing heavily in storing, tracking, and managing data, but data alone doesn’t tell much of a story. Analytics provide the window into what the data means, but proper analysis is critical to avoid a data disaster. If you don’t have the correct insight into your data, it doesn’t just mean you might miss out on a good idea or new knowledge; the data might drive you in the wrong direction, not just a suboptimal one. 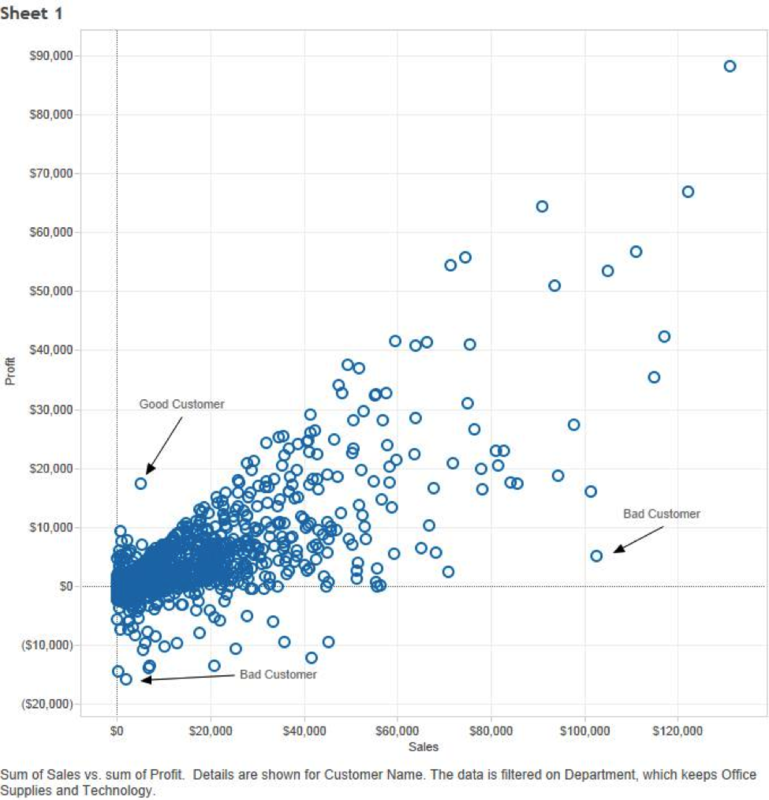 Let’s take a look at a very basic example with customers, profits, and sales from the superstore dataset that comes with Tableau. The goal in this case would be to figure out which customers you don’t want to do business with anymore and which ones you want to increase business. This is a slice of our data, but of course, the data by itself doesn’t tell us much. At best, we could sort the data and then attempt to increase business with our highest profit customers and cut the customers costing us money. Before we jump to any conclusions, let’s do some more analysis and data discovery by using a data visualization. This makes it easier to pick out good and bad customers. Targeting individual customers is one way to go about it, but that doesn’t translate well as a general business strategy. If we bring in more data to drive our analysis, we might gain a little more insight. 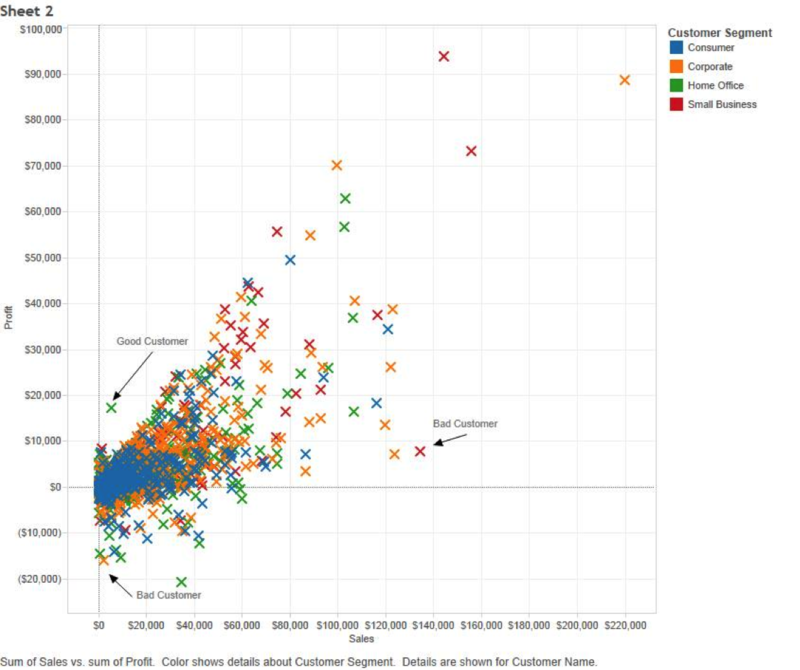 We added customer segment to see if one area of our customer base was out performing others. It does seem like corporate and small business tend to have more profits per sale than home office and small business. We can add trend lines to verify the correctness of this guess. As you can see, small business generally has the best profit per sale. From this we can see that we should not just target customers based on profits and sales, but rather profits and sales compared to like businesses. We can also note that we should concentrate on the small business segment because that appears to be the most profitable. What happens if we remove customers from our view and look at the data a different way? 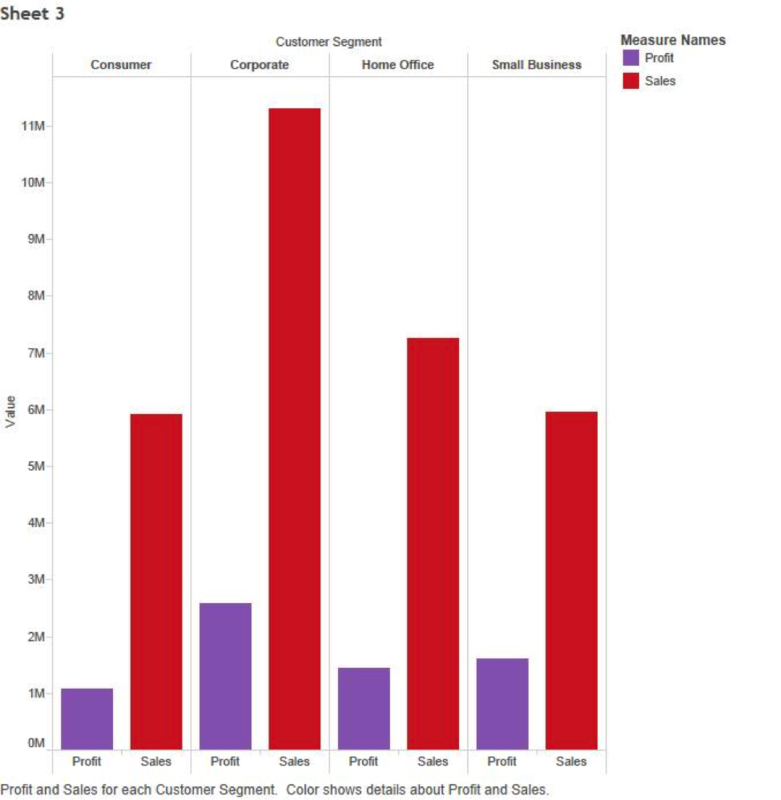 This view shows us that profits and sales are highest for corporate customers and that there is not much difference between the other three categories. We could infer from this view that corporate generates the most profit, so we should put more effort into growing and maintaining these customers, which is a different conclusion than the last view implied. When working as a data driven business, it’s important to remember that the data itself doesn’t tell a story, but it allows people to discover and prove ideas about how the business is working helping to start a conversation about where and how to improve. The data may be driving, but someone still has to tell it where to go. How you analyze and present data will provide direction as much as the data itself.